Three consecutive Workshops were held in Protaras, Cyrpus, on September 28th and 29th, 2015. The MS11 workshop started with the presentation of two good practices examples intended to illustrate how to help peer institutions with the building and implementation of Gender Action Plans: the INTEGER Project online Guidelines (FP7, CNRS coordinator), designed for research and higher education institutions seeking to improve the position and progression of women researchers through the implementation of gender action plans; and the preliminary information on the upcoming EIGE online tool for developing a Gender Equality Plan for Research Organisations and Higher Education Institutions. The workshop continued with a presentation of the main WP2 results about existing initiatives promoting structural change with regard to gender equality in research institutions, at national and institutional level, followed by a group discussion to find the most appropriate and effective activities to be implemented within the framework of WP4 Task 2 “Designing and implementing joint gender equality training schemes”. 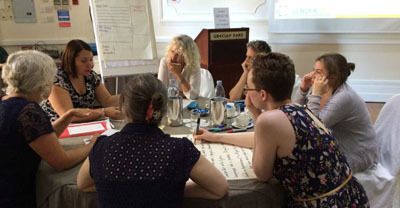 The consortium decided upon developing pilot trainings in two of the partner countries, Cyprus and Slovenia, which do not yet have a running Gender Equality Programme. The workshop began with the first-steps-preparation of the high-level Strategic Seminar on the gender dimension in research and innovation (MS17) aimed at supporting the integration of the gender dimension into R&I policies, programs and projects, contributing to the implementation of the ERA roadmap and to national ERA roadmaps on gender mainstreaming and research, and providing recommendations. The outcomes of WP3 on Gendering Research Contents and Programmes were presented by the WP leaders (MINECO, CIHR) alongside with the results of the project’s deliverables D3.10, D3.11 and D3.12 and the main outcomes of the previous MS8 Workshop. The workshop continued with an update on thepossibilities for joint pilot interdisciplinary gender research calls a presentation of the republished SwafS-02-2016 ERA-NET Cofund Call framed as a follow up for the project and explicitly based on GENDER-NET findings. 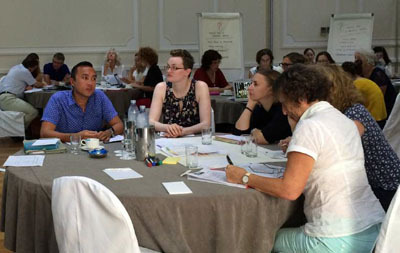 These two models led to group discussions on the possible setting of a transnational award scheme for Research Performing or Research Funding Organisations within the framework of WP4 Task 3 on drawing and implementing common criteria to establish joint Award/Incentive on gender equality/gendered research for institutions.